BEIRUT – The Syrian government responded with defiance Saturday following President Trump’s decision to take military action against chemical weapons production facilities in Syria, describing the attack as an “aggression” that would fail. 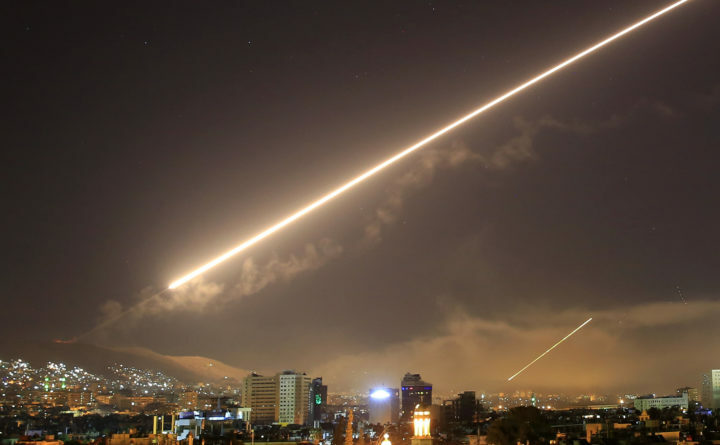 Britain and France joined the overnight strikes – one of them near the capital Damascus – which were intended as a “strong deterrent” against Syrian President Bashar al-Assad’s use of chemical weapons against his own people, Trump said in a televised speech. But after days of Trump’s telegraphing the coming assault, the strikes appear to have taken aim at targets more limited than some within his administration had championed, and the extent to which they would knock out Syria’s chemical weapons production capacity was unclear Saturday. The Syrian foreign ministry described the strikes as “barbaric aggression” and said they would not “affect in any way the determination and insistence of the Syrian people and their heroic armed forces,” according to state news agency Sana. As if to underline the point, Assad’s official Twitter account posted a video at 9 a.m. showing him walking calmly through marble corridors toward his office. In the background, there was only birdsong. Hours earlier, civilians and soldiers had gathered in the capital’s Ummayad Square for a show of support as the sun rose, waving Syrian flags and dancing to songs that praised the army. “We are all your men, Bashar,” shouted one man in footage live-streamed from the area. It was the second time in little over a year that the Trump administration has launched retaliatory strikes against Assad’s army in the wake of chemical attacks. Dozens of civilians were killed April 7 in a suspected poison gas attack on the final rebel stronghold outside Damascus. Trump had signaled for days that military action could follow the chemical attack, with French and British prime ministers Emmanuel Macron and Theresa May also indicating they might favor joint military action. On Saturday, civilians on all sides of the conflict woke up to find the impact of the strikes had been less severe than many expected, damaging only a handful of sites known for their involvement with chemical weapons production. Gen. Joseph F. Dunford Jr., chairman of the Joint Chiefs of Staff, said Friday night that the U.S. military, in conjunction with British and French forces, had targeted a scientific research center near Damascus, a chemical weapons storage facility near Homs and a storage facility and command post also near Homs. Damascus residents had reported loud explosions overnight, which Syrian state media later said was from Barzeh, a military site just north of the city which was visited by international weapons inspectors in March of last year. The exact locations of the Homs strikes were not immediately clear, although Syrian state media reported that three people had been wounded in one of the attacks. On the night of last week’s suspected chemical attack, a network of local flight monitors had tracked Syrian government helicopters circling the skies above the city of Douma in the minutes before the deadliest attack was reported. Video footage would later show rooms packed with bodies, foaming at the mouth and tangled between furniture that appeared to have been upturned in a final struggle. “These are not the actions of a man; they are crimes of a monster instead,” Trump said Saturday. But for Syrians who had welcomed the prospect of strikes – and in many cases, called for them over many years – it did not take long for hope to sour into disappointment.